Hotel "Tourist " can receive 109 guests. We have a rooms of different degrees of comfort - from economy to luxury options. Welcome to our cozy rooms that are fully equipped for your comfort: here you can relax after a busy day. For those who is in on a business trip, we provide all the necessary documents, and breakfast, which is included in the price of stay. Our guests are able to choose the menu of breakfast, minimum order is 35 UAH. 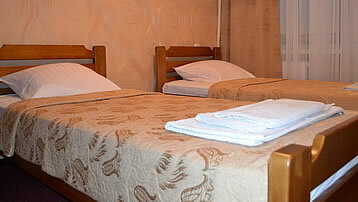 For group of tourists from 20 people significant discount is provided for the cost of room and and food.